Chris Long — Jenkins’ Philadelphia Eagles teammate — also issued a statement after the league’s announcement on Wednesday afternoon. The decision was made by the 32 member clubs of the NFL, according to a statement from commissioner Roger Goodell. The NFL Players Association said it was not consulted during the development of the new policy. 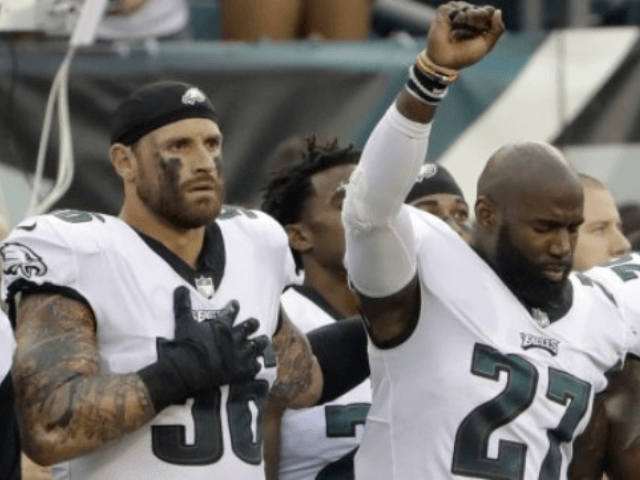 “What NFL owners did today was thwart the players’ constitutional rights to express themselves and use our platform to draw attention to social injustices like racial inequality in our country,” Jenkins said. “Everyone loses when voices get stifled. Goodell echoed Jenkins’ sentiment when it came to patriotism. “The efforts by many of our players sparked awareness and action around issues of social justice that must be addressed,” Goodell wrote in his statement. “The platform that we have created together is certainly unique in professional sports and quite likely in American business. We are honored to work with our players to drive progress. Long, who stood alongside Jenkins during his pregame protests, said he will “continue to be committed to affecting change” with his platform. “This is fear of a diminished bottom line,” he wrote on social media. “It’s also fear of a president turning his base against a corporation. This is not patriotism. Don’t get it confused. These owners don’t love America more than the players demonstrating and taking real action to improve it. It also lets you, the fan, know where our league stands. Cleveland Browns quarterback Tyrod Taylor questioned why players weren’t consulted before the decision was made. “To make a decision that strong, you would hope that the players have input on it,” Taylor told reporters. “But obviously not. So we have to deal with it as players, for good or a bad thing. At the end of the day, they call the shots, make the rules, so that’s what we have to abide by. I think the main thing out of all of it is that each ball club is having open communication with the players and ownership about the issues that are going on in the community and trying to change it. Denver Broncos defensive tackle Domata Peko said that the anthem is a “big deal” for him. New York Jets CEO Christopher Johnson said the Jets will pay the fine if a player takes a knee during the anthem. Minnesota Vikings coach Mike Zimmer said he was proud of his team last season for standing up during the anthem, but he didn’t know anything about the decision when asked by reporters.